Killer clown phenomenon explored old hat or new menace? Killer Clown. New phenomenon or old hat? Anyone interested in clowns cannot have failed to notice the recent slightly hysterical reporting of the latest craze for hooligans in ‘killer clown’ costumes jumping out of bushes and scaring women or being reported hanging around schools! It is all grist to the media mill who just love a scare story but what is behind it and how do the clowns who care about their art deal with it? The Killer clown craze can be said to have started with the appearance of the villain in Stephen Kings 70’s horror film “It!” in which the murderous entity dresses like a clown. This evil clown archetype was then reinforced by John Wayne Gacy, a real-life serial killer dubbed the ‘Killer Clown’ in 1978, there is also the latest incarnation of the Joker character with Heath Ledger, from the Batman movies who wears sinister clown make up and is an amoral murderer. These characters have fostered a fear of clowns, in the general public. 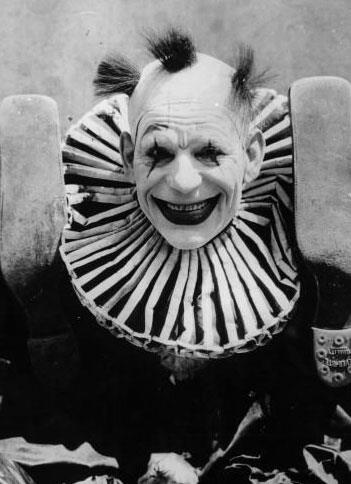 Criminologists and pyschologists agree that the root of the fear lies in the fact that clowns wear heavy make up and paint extreme emotions on their faces that hide their true identity and feelings. “The fascination with clowns is really the fact that they’re not real. We don’t know what is beneath that make up, it could be anyone or anything, they’re actually very frightening” Professor Scott Bonn, Drew University. US. 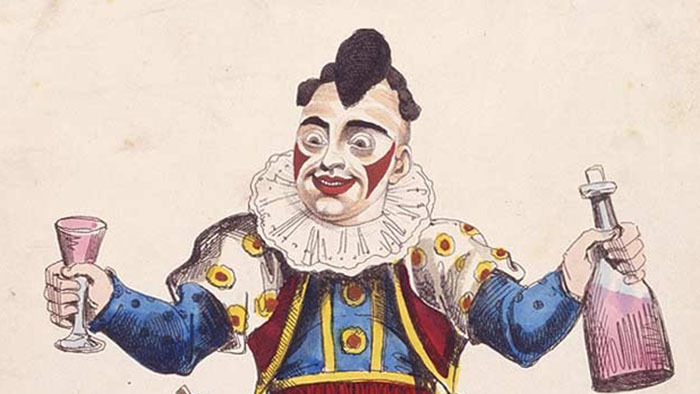 Joseph Grimaldi wore make up that to our modern gaze looks scary. This perhaps then is the point, that it is not surprising that people are scared of clowns because they wear such outlandish make up. Could the answer be to abandon the make up and develop a clown persona that doesn’t rely on artifice but that actually shows the real human, vulnerable and naïve. This is after all what theatre practice clowns learn, to expose themselves and their fallibility in a situation which in turn makes the audience laugh because they see themselves reflected on stage. 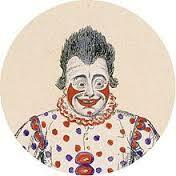 I would argue that real clowns, authentic clowns don’t need make up and this could be a good time to set it aside. 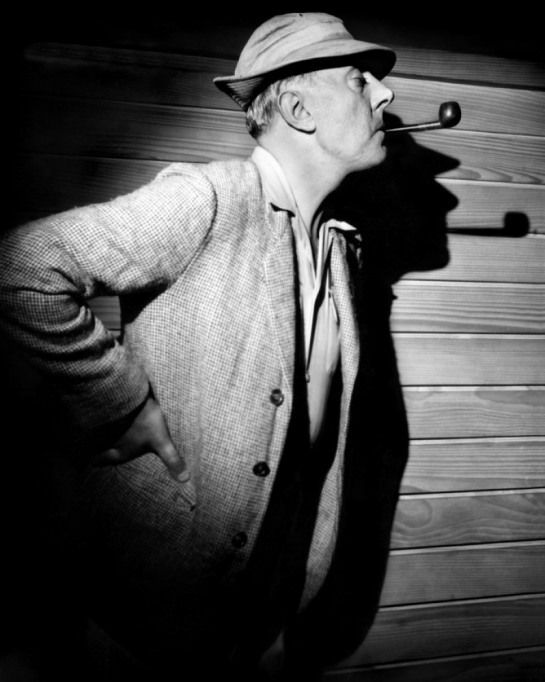 Take inspiration from the master clowns, such as Jacques Tati, Norman Wisdom, Mr Bean, Miranda Hart, Lucille Ball, and many more, none of whom felt the need to disguise themselves. We don’t need organisations like Clowns Lives Matter, a group who are intent on reclaiming the reputation of the clown, it is frankly an offensive reference to the much more important Black Lives Matter movement, clown lives don’t really matter in the scheme of things because they are not real! Lets get some perspective here. Let the tragic bullies in their killer clown costume reap their rewards and let us turn to the real clowns to reassure and rediscover the simple art of making people laugh, love is stronger than fear. 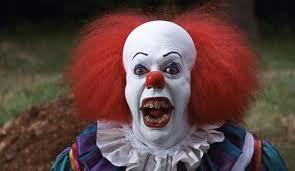 Of course there is the fact that New Line Cinema are in the process of releasing a remake of the original “It!” movie. Scary clowns make a great marketing tool! So finally here are 2 vintage clowns, one anonymous clown and one make up free Monsieur Hulot!